I was looking back through my old recipes the other day. Boy, have I come a long way in the last few years. My first pancake recipes that I posted, here and here were very different from the ones that I have been making for the last several months. Now, I’m not saying that those other two recipes aren’t good, they are. They’re really good. Last week my daughter asked me to make the “old pancakes”. So I pulled up the “GFCF recipe” (although both recipes are GFCF, this one has no whole grains at all). I made them and the kids woofed them down like it was their last meal. But I have got to tell you, it KILLED me to watch them eat that. I horribly regret refreshing their memories. I felt as though I had served them up plates of sugar topped with more sugar and called it breakfast. Mommy guilt, there’s nothing quite like it. On the other hand when I serve these coconut flour pancakes I can feel like they ate a real breakfast. These can be made dairy free by subbing the type of milk used. These are gluten, grain, soy, and refined sugar-free. They are much higher in fiber and are quite filling. I almost want to say that they are low carb. No, they aren’t exactly like the all starch/sugar ones. They have a courser texture but are still moist and very satisfying. A big key to the cooking of these is making sure they are small. It will help with turning and consistency. Combine dry ingredients in a bowl and stir to combine. In a separate bowl combine remaining wet ingredients. Combine wet and dry and stir until there are no lumps. I use a non-stick griddle pan (go ahead, flame me!) set at 325 degrees. Spoon approximately 1 tablespoon of batter on to hot griddle. When the edges are set and there are small bubbles that are beginning to break open in the middle and the bottom is browned, flip and brown the other side. 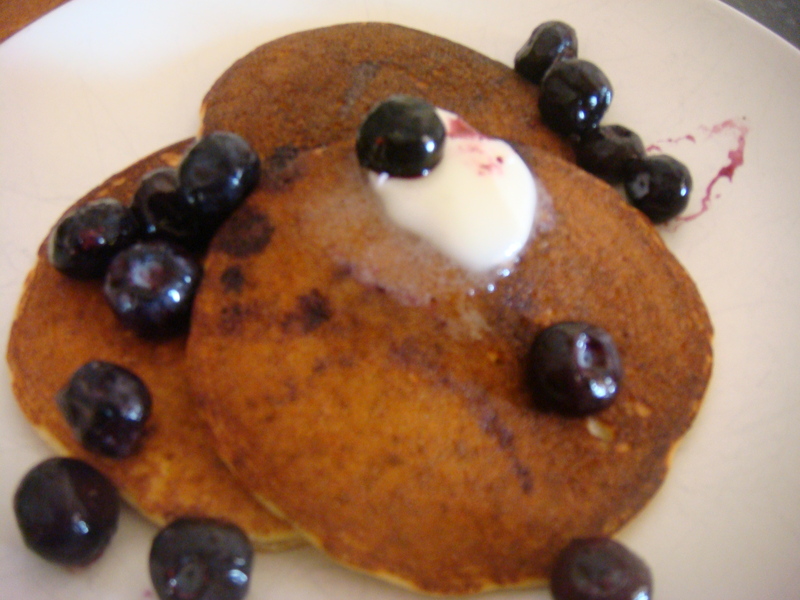 Personally I love these with LOTS of butter and fresh or frozen blueberries – no syrup. The kids however have to have their syrup. Oh well at least the pancakes are good for them. Thank you for posting this recipe! We are grain free in our home every weekend and the kids love pancakes on Sundays. I think I will make these pancakes tonight with some wonderful grassfed bacon! Now why haven’t I thought about that: those pancakes for dinner. It’s so quick. Hope you enjoy like we do. Have you ever tried coconut nectar to replace the kid’s syrup? Check into it, it’s AMAZING, low GI and raw. No I haven’t tried it. Low GI!? Thanks so much for the tip. I will definintely look into it! Can you please tell me where you can purchase coconut flour in the Edmonton area? I don’t actually live in Edmonton anymore but my family does. I think my mom picked it up at Planet Organic, the one just off Whyte. I get mine online at Tropical Traditions. It is sooo expensive in the stores here and the TT one is a great quality. I know they deliver to Canada but I have no idea about the cost of doing that. Any suggestions for kid syrup? Make your own. If you had some frozen berries, which I buy from Costco you could add a bit of maple syrup or coconut sugar to that and simmer it for a while, let it cool a bit and you’ve got sugar reduced syrup. Mmmm. that sounds really good. I also stumbled across a recipe for almond banana pancakes that were nothing more than almond butter (again from costco), mashed over ripe bananas and eggs. You wouldn’t need additional syrup for something like that. Once I get that recipe down I will post it.